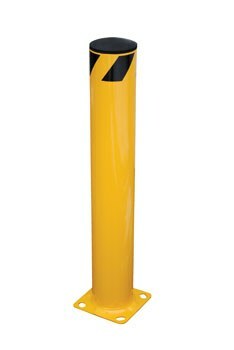 This 42 x 5 1/2 inch Steel Pipe Safety Bollard can be used both indoors and outdoors to protect work areas, racking and personnel. Molded rubber caps are removable. Base plate includes pre-drilled mounting holes. The unit has a yellow powder coat finish and a heavy-duty welded steel construction.